Should The NSA Bug Beehives? Statistical analysis has shown that in the past ten years a great threat has been lurking under every dandelion, apple blossom, and tulip growing in the United States, one that is seemingly innocent but is proven to be even more deadly than we could have imagined. And it is with us nearly everywhere during half the year. Your children playing in your back yard, they are especially at risk to this menacing brood. This threat is not to be taken lightly, as it is even greater than terrorism, which you all know is the worst threat our politicians tell us there is. My fellow Americans we need to look at the degree our government has gone to protect us from terrorism. The NSA monitors seemingly every e-Mail, telephone call, video uplink, and cellphone record it can to address this threat along with billions and billions of dollars for nebulous programs, fought long wars, all to protect us from terrorism. But if this effort is warranted to protect us from terrorism, it is only reasonable that an even greater effort should be waged to protect us from a worse threat: Bees. Alarming statistics show that in the last ten years, more Americans have died on U.S. soil from bee stings than have been killed at the hands of terrorists. Bees have murdered ten times more people here than terrorists have. (An average of 45 deaths per year from beestings and just over 4 from terrorism) Since the federal government has curtailed civil liberties, fought wars, and spent hundreds of billions on terrorism, does it not make sense to fight the War on Bees in the hive before we have to fight them on our soil? 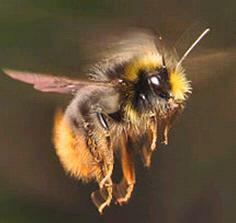 It is now becoming obvious to those who study the mysterious ways of bees the threat is clear and present. Effort must be made to send agents into the hives: A target that has proven to be difficult to infiltrate. Our NSA needs to be given powers of surveillance on these hives. This of course must be in conjunction with our business partners in the hive manufacturing industry and partner with assets in the beekeeping and orchard occupations to provide valuable human resources to keep tabs on the bees: Because, every honey bee in the United States is potentially a killer bee. 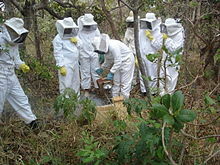 But we must also recognize threats from the rogue hives that can be found in trees, logs or buried in the Earth. It is important that we address these rogue states with appropriate expeditionary military forces to occupy ungoverned groves and grasslands where bees train and thrive. We must deny bees a base for which they can launch deadly attacks on our homeland. But bees create cells easily, and have proven themselves very capable of launching Drone Attacks on civilians. We must not allow a drone gap between us and them, especially in mineshafts. Paid for by a defense contractor in your area. Oh… Let’s see… Most beehives are in remote areas….. What better way for surveillance to take place….. Darren thank you…. Your point is well taken, even if it is the one of the top of your head. I don’t recall it being yellow jackets that took over a couple of airplanes and crashed them into the World Trade Towers. Or, bumblebees who caused that plane to hit a field in rural western Pa.
Go ahead and make your arguments, its essential to democracy and civil liberties that such arguments be propounded. But be prepared to make them before the son or daughter of a parent murdered by the well-off, anti-Western, disenchanted Muslims on 9/11. When a Nazi burned the Reichstag to the ground in 1933, the President, named von Hindenburg, issued the Reichstag Fire Decree. He blamed the Communists. The Decree suspended all civil rights and legal protections against the practices which followed. We have our own parallels. The 9/11 Twin Towers bombing and the Pentagon bombing followed by the Patriot Act and other statutes and Decrees. Clapper lies to Congress. Then Congress lies to you. When they come for you there will not be anyone to object or complain or stand up for you. You did not stand up for anyone else. You did not stand up when they bug your phone, read and copy your emails, search your purse, steal your bank records. The only place you will get to complain is heaven or hell. There is a song that gets sung to complainers in hell. It is called Weenie, Weenie, Go Beenie. A profiling suit from the ACLU is looming – and I can’t wait to see the Supreme Court sitting indecisively on them……………. But don’t forget they may think this is a real consideration seeing as how the military NSA is very mad. it should be noted that honey bees have a barb on their stingers and that after stinging it tears open the bees abdomen killing the bee. extraordinary measures are necessary to combat these suicide bent bees. perhaps a color coded system to tell us when the chance of bee stings are highest. or use economic measures to bring the wasps in on our side. in any event I’m sure we can recoup the money spent eradicating these bees with the sale of their honey. I think the NSA is behind the mysterious killing of honey bees. Actually, I want the government (and every other entity that can) gathering as much information about bee populations as possible—not to protect us from the bees, but to protect the bees from us. Colony collapse (which I’m guessing is what gathering info on bees is about) is a much more serious problem than terrorism… or even incursions into civil liberties. I think we’re doing a good job of killing off the bees without any help from the NSA. You didn’t even get to the “red menace” of fire ants. If ever a creature was designed to be a miniature terrorist, it is the fire ant. Step on a fire ant mound while wearing sandals and it will make a believer out of you….provided you survive. There needs to be multiple NSA sting operations all over the country to address this national threat.